Deborah Freedman captures the phrase small but mighty in this beautiful picture book. 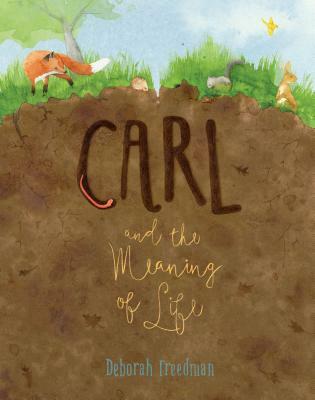 Carl is an earthworm who is happy to munch on dirt until he begins to question his role. As time passes and Carl searches for answers, the ecosystem he helped sustain falls apart. The water-color illustrations pair perfectly for this story of hope and change. I can also see this working well in a classroom to talk about our environment and the ways we each can do our part to help. Carl is an earthworm. He spends his days happily tunneling in the soil until a field mouse asks him a simple question that stops him short: "Why?" Carl's quest takes him on an adventure to meet all the animals of the forest, each of whom seems to know exactly what they were put on this earth to do, unlike the curious Carl. But it's not until the world around him has changed that Carl begins to realize everyone, no matter how small, makes a big difference just by being themselves. Deborah Freedman (deborahfreedman.net) is a trained architect who now works as an author/illustrator. She is the author of This House, Once, Shy, By Mouse and Frog, The Story of Fish and Snail, Blue Chicken, and Scribble.